If Fabros Farm accomplishes their goal of planting more than 50 hectares of their forests with cacao, then it would become one if not the biggest cacao farm in Northern Luzon. My introduction to the Fabros Farm is by way of a blog post - My own Bean-to-Bar chocolate making experience. Mr. Ansel Fabros, a medtech in Canada got to read my blog and that started our exchange about cacao and chocolate. He was also instrumental for the first cacao seminar I attended that was offered for free by SOAP. There I met with his brothers Arnold and Ariel and some of their farm technicians. They brought and gave me several cacao pods (they call native variety) that I am now growing as seedlings. He agreed on my request to visit their farm. So past midnite, on a Holy Thursday (April 17, 2014) , with bus terminal jam packed with people, I joined the chaos of an hour-long queue of commuters wanting to get a ride. Lucky enough to get a seat to Cabanatuan and then a van ride to Aurora, I arrived safe for the first time in the province. I was received at the public market and was brought to the nursery of the Fabros Farm. I was told that there are around 50,000 seedlings ready to be transferred to the site. Most of the seedlings were grafted. And that they have a 70% success rate of survival for their grafted seedlings. The grafted seedlings appear to be healthy, although some of the leaves shows sign of being eaten by insects. The farm uses insecticides to keep away insects from harming the seedlings. In some parts, the nursery is a bit grassy, almost serving as shade to the seedlings. Aside from the seedlings located on the designated nursery plots, some of the seedlings were also under mango tree serving as shade. Although not prevalent, one of the problems identified is the presence of some fungus that seems to attack the roots of seedlings, making them rot. Solution to the problem is still being identified by the farm technician. Cacao is endemic in the locality of Maria Aurora. In the neighborhood of Brgy. Diaat alone, cacao trees are grown in backyards. I was even shown of one resilient and abundantly fruiting cacao that is precariously thriving on a rocky ground on one end of the bridge just on top of its abutment. The tree appears like dangling on a cliff above the rushing water. In other locations close by the river are some tall cacao trees that are intercropped with coconut and other trees. The trees are more than five years old and showing some of the common cacao diseases. Fabros Farm manages two separate locations for their cacao farm. One of the locations is called Agtedtedted more than 20 hectares and the other area is called Mumunsi, bigger area and several locations of more than 30 hectares. Both are forest areas that used to be logging sites where remnants of cut trunks of huge and giant trees are on a state of decay. And the road system for 6x6 trucks remain passable. Agtedteded is the pioneer farm. The location is about two kilometers away from the residential areas. Going to the area one has to traverse the long and winding river system. Given also the condition of the bumpy roads, the seedlings from the nursery are allowed to recover for a week after they get transported to their new location. After more than six months, almost half of the cleared area are now replanted with cacao seedlings and other intercrops. The distance they implement is 3.5m x 3.5m for coconut and cacao intercrop and 3m x 3m for cacao to cacao. The location has a spring that serves as a source of potable water for drinking and farm use. Several farmers are tending the farm doing different farm duties. Some are clearing the farm for planting. Others are making charcoals from the fallen trees. Others do the spraying of a cocktail of foliar, fungicide, and insecticide. Spraying is one of the most challenging tasks given the hills get steep. Additional workers are being considered so as to cover spraying the wide expanse of the area. Corn is used as shade and intercropped with cacao. Other vegetables are grown as well to serve as source of food for farmers who prefer to stay in the farm for the whole duration of the weekdays. Fruit trees and other trees (madre de kakaw) are also planted to serve as wind breakers. Meanwhile the Mumunsi is the second location for the cacao which is more expanse. In an adjacent area are some old coffee trees which will be rehabilitated and soon planted with new coffee trees. Plots of coffee seedlings are also maintained in that location. There's a small cottage being built on top of the farm. And just below it is a swimming pool size pond to raise fresh water fishes as future source of food for farmers. Water source is from a spring. An almost kilometer length of water pipe was laid out from the spring to the cottage. There are lots of work that still needs to be done in the area. Much of the cutting of trees and clearing are still on-going, although in the cleared area close by the cottage it is already planted with cacao seedlings. Transport of the cacao seedlings are being scheduled since the river gets swollen during rainy days and the rainy months is soon to come. Since the location is surrounded by forests, it gets cool in the late afternoon and sometimes showers at night. Mr. Ansel Fabros is well aware of the challenges and concerns that they are faced with. But since he has invested most of his savings and support from angel investors, there's no more turning back. Fabros Farm continues to invest in training their farm technicians. 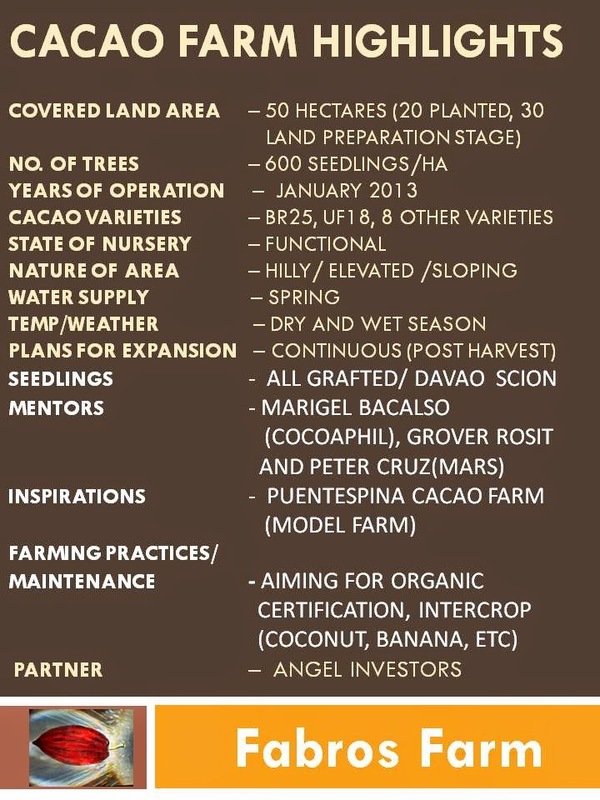 They are scheduled this summer for a 2-week cacao farming immersion with Mr. Peter Cruz in Davao. When I went home in 2012, I saw many folks are jobless and just hanging around in our barangay (village). Also, I felt like that some of the amount we give as investment for the family business back home are going nowhere. Some of our properties remain idle so I started reading about High Value Crops and cacao got my attention. I did research on the internet and communicated with some cacao players. And was frustrated BIG TIME with government's lack of reply to my queries. When I consulted a friend about cacao growing and believes in the profitability of the project, that's when Fabros Farm started. I have high hopes about this project. It is a very ambitious and daring and I credit my brothers effort. They are all absorbing the stress and pressure from me. I hope someday, it will not only my family that will benefit but the rest of the folks in our barangay. When the cacaos are fruiting and we have added income, it is my plan to do "contract growing, intercropped with coconut" with or without government assistance. Fabros Farm's pioneering spirit and noble goal of providing livelihood to the people of their barangay is laudable. Despite the many challenges and their lack of experience, the family enterprise make up for it with their collective effort and enthusiasm to see to it that their venture succeed. With its humongous size Fabros Farm is not just a cacao farm but a cacao forest full of potentials.